METANOIA SEMESTER: As this school year draws to a close and we consider our options for the future, we are realizing we need more committed live-in community members in order to move forward. In the past, GCW has offered internships called a “Metanoia semester” to folks interested in an immersion experience of living and working at the GCW, in order to learn more about what we are and why we do it. If this is something that interests you for the fall or spring of next year, contact Daniel Loya to learn more, at 863-207-3670 or daniel.loya.apd@gmail.com. MARK YOUR CALENDARS—EASTER BIBLE STUDY:We are so grateful to Marijka Ulanowicz for leading us in a wonderful Lenten Bible Study, looking closely at the passion story in John’s gospel. She has agreed to come back for an Easter Bible Study, to bring us through the Resurrection and the epilogue in John. We have planned two more sessions: Monday, May 5thand Monday, May 12th, both from 7:30-9pm at the Green House. Please mark your calendars join us! All are welcome, even if you have not attended previous sessions. THIS WEEK’S SCHEDULE:Here’s the short version of this week’s schedule of regular events; for more details click here or contact gvillecw@yahoo.com. APRIL THANK YOU’S:Our continued thanks to Porters Community Farm, Black Acres Microfarm, and the farmers at the 441 Farmers’ Market for all the produce they have donated to GCW this month, and to Doreen for the locally raised eggs. Thank you also to Strongtree Organic Coffee Roasters and Bread of the Mighty for donating coffee for our morning coffee shops, Citizen’s Co-op for the big discount they give us on bulk organic flour for our bread, and Henderson and Daughter Plants and Produce for selling us citrus at a deep discount. We are so grateful to you all! They devoted themselves to the teaching of the apostles and to the communal life, to the breaking of bread and to the prayers. Awe came upon everyone, and many wonders and signs were done through the apostles. All who believed were together and had all things in common; they would sell their property and possessions and divide them among all according to each one’s need. Every day they devoted themselves to meeting together in the temple area and to breaking bread in their homes. They ate their meals with exultation and sincerity of heart, praising God and enjoying favor with all the people. And every day the Lord added to their number those who were being saved. Happy Easter from all of us at GCW! ART-FOR-ALL SALE ITEMS STILL AVAILABLE! We still have many beautiful Art-for-All items left! Proceeds support the Gainesville Catholic Worker and participating artists. You are welcome to stop by anytime the house is open for our events throughout the week (see below for schedule), or contact us at gvillecw@yahoo.com to arrange another time to visit us. The GCW “Green House” is located at 218 NW 2nd Avenue in downtown Gainesville. Check out the Art-for-All page on our website to view pictures of many items: gainesvillecw.org/art-for-all. Microfarm Mornings: Thursday from 8:30-11:30 AM—and the monthly weekend workday is this Saturday from 9 AM -12 PM. Contact Jade Allen via email (jadesallen@yahoo.com) or phone (352-337-0817) for questions &/or directions. Another opportunity to check out Art-for-All creations from this spring: tomorrow (Saturday, April 19th) our own Kendera will be at the Yopp! Inc. “Egg-Streme Spring Fair” at 524 NW 1st Street. 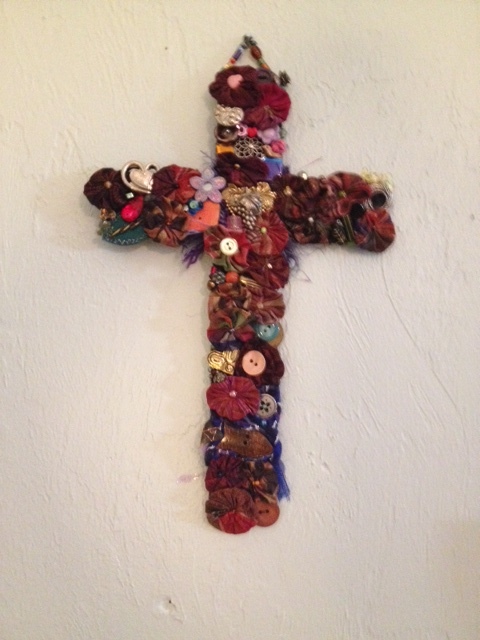 We still have many items left, including crosses, aprons, paper cranes, decorated journals, and more. At this fair there will be Easter egg hunts for all ages, music, food, kids crafts, bounce houses, faice painting, and an art sale–again, including a table of items from Art-for-All! So come on down and look for Kendera, and have a great time while you are at it! Check out the Yopp! Inc. website for more information about this fair. Check out our Art-for-All page on this website for pictures of many of the items for sale. ART-FOR-ALL SALE ITEMS STILL AVAILABLE! Thank you to everyone who joined us for our Spring Open House and Art-for-All Sale this past Saturday. If you missed it, you’re not too late! We still have many beautiful items left, which would be a wonderful gift for someone in your life, including homemade jam, beautifully decorated journals, adult and child-size aprons, painted crosses, candle holders, vases, jewelry, and more. Proceeds support the Gainesville Catholic Worker and participating artists. You are welcome to stop by anytime the house is open for our events throughout the week (see below for schedule), or contact us at gvillecw@yahoo.com to arrange another time to visit us. The GCW “Green House” is located at 218 NW 2nd Avenue in downtown Gainesville. Check out the Art-forAll page on our website to view pictures of many items: gainesvillecw.org/art-for-all. MARK YOUR CALENDARS—EASTER BIBLE STUDY: We are so grateful to Marijka Ulanowicz for leading us in a wonderful Lenten Bible study the past several weeks, looking closely at the passion story in John’s gospel. She has agreed to come back during the Easter season, to bring us through the Resurrection and the epilogue in John. We have tentatively planned two more sessions: Monday, May 5th and Monday, May 12th, both from 7:30-9pm. Please mark your calendars join us! All are welcome, even if you have not attended previous sessions. THIS WEEK’S SCHEDULE: Here’s the short version of this week’s schedule of regular events; for more details click here or contact gvillecw@yahoo.com. Holy Week might be a great time to visit us, if you have not done so before. “You are forgiven,” she smiles. then whisper in the cereal section. but as it is…they asked her to move on. And she was informed upon. persuaded her into a car. We are reduced to forgetting. Peace, and Blessed Holy Week to all of you. Art-for-All Spring Sale Saturday! Last Lenten Bible study tonight! Join us! ART-FOR-ALL SALE THIS SATURDAY!Join us Saturday, April 12, from 1-4pm at the Green House to celebrate spring, share some delicious refreshments, and see the beautiful and creative arts and crafts made from “up-cycled” material at our ART-FOR-ALL weekly workshops this spring. Items include homemade jam, beautifully decorated journals, adult and child-size aprons, painted crosses, candle holders, vases, jewelry, and more. Mother’s Day and graduations are just around the corner—do you need a gift for someone special in your life? Proceeds support the Gainesville Catholic Worker and participating artists. The GCW “Green House” is located at 218 NW 2nd Avenue in downtown Gainesville. Check out the Art-forAll page on our website to view pictures of many items: gainesvillecw.org/art-for-all. Find our facebook event page here and help spread the word! FINAL LENTEN BIBLE STUDY TONIGHT—LOOK FOR TWO MORE SESSIONS AFTER EASTER:Tonight, Monday, April 7th, from 7:30-9pm is our final Lenten Bible study session, to look at the third segment of the Passion of John with our resident scripture study expert, Marijka Ulanowicz. As usual, we will begin our time with a brief Lenten prayer service, and this will take the place of our usual Open Table prayer service for April. All are welcome, even if you have not attended previous sessions. Also, it looks like there will be enough interest to meet again after Easter to explore the Resurrection and Epilogue in John, so look for information about these sessions in future updates. They will most likely take place at the end of April/beginning of May. Again, he bent down and wrote on the ground.